Standing "with with our noses almost touching" | Jon Katz, P.C. Anwar Sadat, Jimmy Carter and Menachem Begin sign the Camp David peace accords (1978). In late 1992, I took a detour driving back from Florida to Washington, DC, to visit Plains, Georgia, because I was still fascinated with Jimmy Carter — warts and all — who returned to Plains after his presidency. As luck had it, I met President Carter briefly, as he left the annual December 31 barbecue lunch at the back of a downtown store. He seemed in a hurry, so we had little more than time for a brief chat and his suggestion to take a photo, so that he could move on. This man whom so many characterized as a weak president has long been a very strong and no-nonsense man, including his apparent penchant not to spend too much time eating barbecue on December 31. He appeared to many to be a weak president, in large part due to some fierce fires that started and raged during his presidency, including runaway inflation and interest rates, the hostage crisis, and the energy crisis. Offsetting that were his smashing success obtaining the historic peace accord with Egypt and Israel and his putting human rights closer to the front-burner of presidential affairs. After leaving office, Carter has had substantial successes bringing fierce opponents to the negotiating table and inspiring everyone to work for the poor and for social justice. I have not yet reached a conclusion about his recent and controversial book Palestine Peace Not Apartheid, but will have one once I have obtained and read it. This past Saturday, I heard President Carter emotionally relate how he convinced Anwar Sadat to reverse his decision to leave Camp David in mid-negotiation. This situation relates to my criminal defense practice in highlighting that any interest in being popular must take a backseat to the interests of a criminal defense lawyer’s clients, and how criminal defense lawyers must always walk around with sharpened proverbial weapons ready in their back pockets just in case. 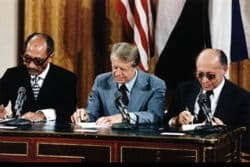 Sadat stayed — maybe he would not have stayed had the availability of American economic and military aid not been at risk — and the parties signed a peace treaty twelve days after the talks began. Carter’s no-nonsense approach with Sadat — mixed with his caring and perceptiveness — carried the day. Similarly, successful criminal defense also repeatedly calls for a similar approach. Another lesson I learned from this period in history is from the first meeting in 1977 between Begin and Sadat in Israel. I watched on television as they emerged from their meeting and optimistically confirmed that at least they had agreed to be able to disagree. When an opposing prosecutor tries giving me grief about a proposal I make to negotiate a settlement or about proceeding to trial, I sometimes suggest that we approach the matter in a similar vein to Begin and Sadat’s agree-to-disagree approach. Sometimes, when all else fails, a firmer approach than that is needed in dealing with opponents when they act unreasonably.